President Trump has said the U.S. government would have a "full report" Tuesday. Over the weekend, President Donald Trump said that the U.S. government would complete a "full report" on the killing of Saudi journalist Jamal Khashoggi by Tuesday while denying reports that the CIA has concluded that Saudi Crown Prince Mohammed bin Salman ordered the killing. But a State Department official who has seen a version of the CIA's assessment on the murder of Saudi journalist Jamal Khashoggi told ABC News it's "blindingly obvious" that the crown prince, known as MBS, ordered Khashoggi's death. "The idea that it goes all the way to the top is blindingly obvious," said the State Department official, speaking on the condition of anonymity. "There's overwhelming consensus that the leadership is involved -- no one is debating it within the government," the official said. While saying no doubts are expressed in the report, the official acknowledged that the words "probably" and "likely" are used when attributing the death to the crown prince. The source noted that CIA analysis reports rarely include explicit conclusions. Among the evidence cited in the report, the official said, is the relationship between members of the kill team and the crown prince, and the hierarchy of the Saudi system. The official said the report is based on communication intercepts -- including prior phone calls between the kill team and aides for the crown prince -- and on the ground reporting and analysis. The official said the government's reporting was being updated daily. "In the days ahead I expect we’ll be reviewing that full report and the president will be making the decisions about what the path forward is," Vice President Mike Pence told reporters on Saturday. "Recent reports indicating that the U.S. government has made a final conclusion are inaccurate. There remain numerous unanswered questions with respect to the murder of Mr. Khashoggi," said Heather Nauert, the department spokeswoman on Saturday. "The State Department will continue to seek all relevant facts." She added that the U.S. will continue to investigate the murder while "maintaining the important strategic relationship between the United States and Saudi Arabia." ABC News reached out to Nauert for comment on this report Monday night but got no response. The Saudis have denied the crown prince ordered Khashoggi's killing. (Mandel Ngan/AFP/Getty Images) President Donald Trump shakes hands with Saudi Arabia's Crown Prince Mohammed bin Salman in the Oval Office of the White House, March 20, 2018, in Washington, DC. Trump, in an interview with Fox News that aired Sunday, made clear that an audio recording of Khashoggi's killing, supplied by the Turkish government, would not affect his response to the Oct. 2 killing of Khashoggi, a columnist for The Washington Post who had been critical of the Saudi royal family. "It's a suffering tape, it's a terrible tape. I've been fully briefed on it, there's no reason for me to hear it," Trump said in the interview with "Fox News Sunday." ''I know everything that went on in the tape without having to hear it." 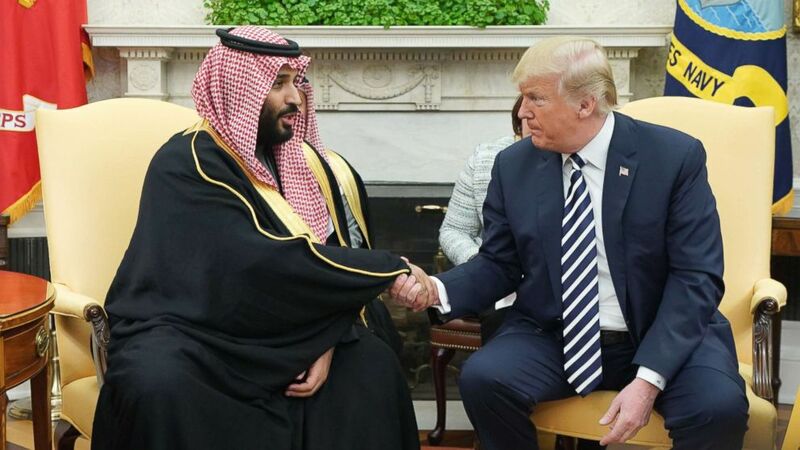 Trump also noted that the crown prince has repeatedly denied being involved in the killing inside the Saudi Consulate in Istanbul. "Will anybody really know?" Trump asked. "At the same time, we do have an ally, and I want to stick with an ally that in many ways has been very good." On “This Week” Sunday, incoming House Intelligence Committee chairman Adam Schiff told co-anchor Martha Raddatz it would be unlikely such a killing would occur without the Saudi crown prince’s knowledge. “Given what we know of how the Saudi government operates and the crown prince's central role in that, it's very difficult for me to conceive of a murder of a prominent journalist and a critic being carried out without the crown prince's knowledge,” the California Democrat said.